What is DropShip: Our Client simply lists the products they like or think will work with their Shop range. Once their retails customer purchases the item, we will deliver the item directly to the end user. Saving your the Processing, Postage and Packaging. 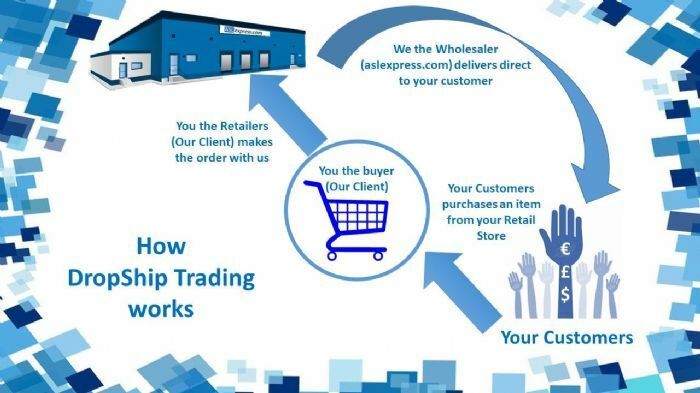 Simply buy the single item from us when you sell the product and place the raise customer details in the delivery details section when purchasing. We will then deliver to you customer once payment is cleared. Items listed in the DropShip section may be 10% more than the Wholesale Prices offered in the normal part of the website. However you will save on Packing and Posting the item Yourself. Other Wholesale Cients who rather hold stock and purchase in larger batches are also free to pick any single items from the DropShip section. When will DropShip Service be offered: We are currently working on Secure Delivery Prices around the world for Small Parcels. Thereafter we will begin testing the DropShip offering with a small range of Products to begin with. Who to contact: Contact Dev@Aslexpress.com if you require any more information or suggestions. We will also notify you once the DropShip section is ready.